Well I wanted to play with a sketch that I did of Rogue and wanted to add many characters that I really love in the most beloved character Rogue. I wanted to add Gambit into the drawing but it was taking away from it somehow so I just put his abilities in just to say what the hey. Well I'm starting to like coloring my work now it just completes the vision. I will do one of Gambit or combo like I did before, but more in character. Well guys please tell me what you think. Have to wonder how long before the Phoenix Force corrupts Rogue. Great image all the same! Wow that is crazy old...hahaha forgot about it honestly. Now seeing it many years later I thinks its a hot mess. But I think the pose is strong. I was very afraid of the digital process then. I think if I redid this people would so eat it up. Thank you for sharing your thoughts with me I do greatly appreciate it. And I'm happy to know that you like it. You're welcome. I'd love to see the "remastered" version of it! She looks a lot like Jean! I agree with Marek-Kerem. It is just that exactly! I wonde rhow Rogue got the Witchblade gauntlet? Oh, it would SO love to be with Rogue. I hope Storm, Phoenix, and her beloved Gambit will wakeup just fine after she borrowed their powers. -Thanks for sharing your thoughts. She looks incredible! Great job! Thanks, I was worried that people may not like the character blending. But when it comes to just the image, I think it just needs a better background. The background I hate. I wanted the space look with a moon or planet in the background, but honestly I have no idea. But thanks that you're diggin' it. And thanks I got the brush from a really awesome artist @ DA: adonihs. Well if its not an eye swore then I'm glad. I think if I had more time the fire could be done, more of a finished look. But over all I'm really happy. Skin for me is so tough. I think adding the Gambit character's abilities was a mistake, instead of playing up the Phoenix character's abilities more than the Phoenix in the background. But of course I could be wrong as well. Overall a very good piece of art, no doubt about that. No thats good I'm glad to read everyone thoughts. I'm happy that you shared. I thought having the Witchblade was the wrong thing to throw in, but I wanted to try to mix in all of my favorite characters into Anna. I gave her more of a Phoenix feel and still keeping Rogue looking like Rogue. 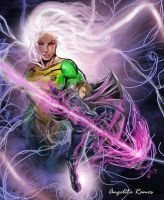 To be honest I was reading a lot of history on Rogue and Gambit and she has absorbed him so much that he almost lives in her. And in one comic he dose, which didn't take so well for me, because he dies. But thanks so much for your thoughts.